On these special days, try to put aside time to do more practice and be mindful of your positive and negative deeds. This is a Buddhist festival celebrated to observe the descent of Buddha from heaven back to earth. Buddha had left for heaven at the age of 41, having ascended to The Heaven of Thirty-Three (Trayastrimsa) in order to give teachings to benefit the gods in the desire realms and to repay the kindness of his mother by liberating her from Samsara. He was exhorted by his follower and representative Maugalyayana to return, and after a long debate managed to return. This is considered to be one of the eight great deeds of the Buddha. He returned to earth by a special triple ladder prepared by Viswakarma, the god of machines. On Lhabab Duchen, the effects of positive or negative actions are multiplied ten million times. It is part of Tibetan Buddhist tradition to engage in virtuous activities and prayer on this day. With some hesitation i put these records online to share with readers. Some people may view it with great doubt. But from own real life experience, i have seen such things being done. Achuk Lama Rinpoche is famous in Tibet for helping to dispense advice to help the deceased due to his omniscience. These are 52 cases of causes-and-effects concerning deceased people who received Achuk Lama Rinpoche’s help in observing their state after death and determining the causes of these states (ie, the actions the deceased had performed prior to their deaths) It is a chilling teaching to us and evidence of the unfailing nature of karma cause and effect as well as a testimony to the sufferings of samsra. May all beings avoid all negative deeds, perform all positive deeds and purify their minds. When I (Achuk Lama Rinpoche) was asked where Chalole’s younger brother had taken rebirth, i replied, “Is this person deaf?” Everyone replied, “Yes, Tsewang is deaf.” I said, “He seems to have killed a snake.” They said, “When he was young, he dug out a snake and killed it while playing.” I said, “Behind your house, there is a pile of rocks, in it is the snake. Bring it here.” When they went to look, they really found the snake and brought it to Lama Rinpoche. Later the snake was salvaged through confession by recitation of scriptures etc. Someone asked me about his father’s rebirth when i was beside Zhala monastery, i said, “He has reborn in the womb of your family’s horse.” Later when further asked, I said, ” The brown/tanned color female horse’s group of foals, among them the one with a black lip is the one. All the prayers were performed for him. I went to Shangya to perform 100,000 burnt offerings. There, an old man called Zhaduo who due to having harmed a great master was now boiling in hell, i could not help him. In Shangya, Genxi’s partner when performing rituals for crossing-over the dead soul, asked me to observe. I said, “Reborn as a huge fish, many small fishes are chewing on its body, experiencing unbearable suffering.” Due to this, for two days, i did not recite anything but rested in meditation. That old man was a fisherman in Gantse, his trade was well known by everyone. Quzha Lama of Kangnan monastery asked me to observe when he was performing prayers for the deceased, i said, “As this person always meditated on Guru Rinpoche as a Yidam, he has taken rebirth in the Copper Auspicious Mountain (Guru Rinpoche’s pureland). When i was reciting one morning, in a state i observed, at the foot of the western mountain there was a large slab of rock, beside it, a young man was giving rise to great anger. I exerted my mind strongly thinking to benefit him. This man is the son of the official in Lada, he killed someone and was executed by the country. When i was staying in Palyul, Karma Tsewang asked about the old lady Tsela’s rebirth. I said, “She is attached to a golden ear ring.” Several days later, they brought that golden ear ring to me. Her family said, “Can we use 1000 yuan to perform prayers and keep this golden ear-ring?” I said, “This ear-ring is worth 10,000 yuan, how can 1,000 yuan do? This is your partner, do as you see fit.” They used the ear-ring for her prayers and she took rebirth in a positive realm. Lawei, an old man, killed storks in the past, but owing to power of the prayers at his death, took rebirth as a heavenly stork in the heaven of the 33rd. The mother and son storks were of the same size. Someone from Dalomairema asked me about his father. I said, “Your father has taken rebirth seven times as an animal. These animals have been killed by you.” This person did not believe me. I said, “I will tell you in more details, first time, you killed a beast beside a rock, it was trapped by you with an iron hook. It did not die immediately but died after great torment. After a few days, you went to retrieve it home. The second time, you killed a musk deer, in this way you killed 7 times.” Thus the man believed me as if he had seen a real Buddha and did the necessary prayers. A tulku died, someone asked me about his rebirth. I said, “This tulku has no rebirth because he received too much wealth through offerings. He is now in hell suffering.” Besides this i did not say much more because i did not want the benefactors to have wrong view and waste their (merits) of giving. Liaoxi’s Zhalo asked me to observe about his mother’s death. I said, “Reborn as your family’s Yak calf. ” His family asked, “There are two new calfs, which is the one?” I replied, “The one with a shorter right hoof. It has already been killed this winter.” They did prayers for this. In the past, i was asked to observe about Qingba lama’s death. I said, “Make a mani banner that is as long as his body as a merit to salvage him. He is now enduring the suffering of being cooked and burnt in the hells. ” It was done as i said. One day, i saw a small dog and said, “This is the rebirth of an old lady called Awenma.” An old monk Shelok said, “My grandmother is named Awenma, is this her rebirth?” “Yes.” “I will recite 100 million mani mantras.” He brought the dog to circumambulate Yachen’s mani stone piles. Before long, the dog died and was reborn in the positive realms. About Changtai’s Wengzhuo’s death, i was asked and said, “Reborn, now an old dog.” His nephew had a Dri and after parting with this for creating merits, sent off the deceased. Someone asked me about Wazhong’s death. I said, “He killed many calfs, due to that karma, he is reborn as the cow with a white dot on her forehead. She has little milk and is about to be sold. ” They released this cow and did many prayers. Later the cow died and took a good rebirth. When i went to Duomai Gaimo’s place, someone asked about the officer Pajing’s death. I replied, “Reborn as a little monkey in that place. Are there any monkeys there?” Everyone said, “There’s no monkey there.” I said, “You go and take a look.” Everyone went there to look around, and actually saw that monkey. This gave them sublime confidence and they did the prayers. Someone asked about Pama, i said, “He has taken rebirth in body of evil karma, this is the result of slandering the sangha.” When he was a temple-administrator, he said many harsh words to the sangha. When i was asked about Tsewang, i said, “Before he died, he had great anger about the water bags, now he has taken birth as a snake in the water bags. Due to the karma, the water in the water bags has transformed into iron water, he is in great pain. ” Before his death, as the water bags by the window were blown by the wind, he lost his temper at all the people and ordered, “Take it down!” Due to that, after the karma was cleansed, in the winter, this little snake emerged and died. When asked about the old man Dorje’s death, i replied, “He is in the big cypress tree on the mountain behind your home.” They did the prayers for him. When my disciple Kunla died, Ache said,”Please fulfill her aspiration to be reborn in pureland in 7 days. I will also perform great austerities for her sake.” I said, “There is no need for austerities. Go and circumambulate Zhejie mountain.” Kunla’s husband and brother Yewa came to ask about her. I said, ” Go and circumambulate Zhejie mountain, there is an insect born in a rock slab, need to recite 11 times 100 million mantras.” I went to Ache’s home to perform prayers and on my way back, met Yewa who was circumambulating Yachen’s mani stone heaps. I asked, “Are you returning now? Due to the power of merits, the deceased will take rebirth as the daughter of Huazhong after losing her insect body, she will get happiness.” When Yewa returned home, they were using the deceased’s ashes to practice and found a slab of stone to grind the bones into powder. There was a insect under the stone which was still alive. It was alive for more than 11 months, and after that, they practised the ablution and blessed sand methods on the insect, it died later on. That insect should be the one. Someone sent by Jiadu Tulku to me to ask about an old person. I jokingly wrote on the letter, “You should know clearly where this person is born, aren’t you the one who salvaged him? Aiya, i saw that he seemed to be in a hell of red bronze being cooked and burnt. The karma is to maliciously break the bronze pot of Jiadu monastery. ” In the past, when Jiadu monastery was having a puja, one night, someone drilled a hole in the bronze pot, but no-one knew who did it, but it seems that this is the person. There were many more happenings at that time. When asked about Wangchen who was murdered, i said, “He is an evil person, and stole many animals that had been released by the master Puduolo, and sent them to Litang to sell. Therefore his way of death was very negative, he is now in the Iron Thorn Forest, you need to do much confession with the recitation of Kangyur. A beggar Yema died and i was asked. I said, “Attached to a silver spoon and greedy about eating. Not sure if reborn as a dog. Should give that spoon away to create merits.” “I did not see that spoon.” I said, “There is one definitely. If it is not given for merits, then the deceased definitely can’t attain the positive realms.” That female beggar had a silver spoon but it was taken away by children and lost, before her death, she was still looking for it under her pillow and bed. Renle performed much practice and received much wealth. He had several children and created negative karma but not even one children became ordained. After his death, i said, “Reborn as a pig with white forelegs beside the road to Ganzi. The benefactors have take birth as his piglets and are suckling his milk. ” His family made many mani banners and did the prayers. In the past when Sera Yangtrul wanted me to speak about the crossing-over of the dead people, Tulku Rinpoche (Arik Rinpoche) said, “You must continue with advising others about the prayers for the deceased.” Thus i continued and have advised more then 100,000 people about this. Here, for the benefit of letting people know about the qualities of the Guru, the suffering of samsara and giving them faith and understanding about karma, i have briefly described some. This entry was posted on 12121212, in Practices, Uncategorized. It is said that dedicating the roots of goodness is extremely important. If you perform virtue but do not dedicate it, it will become depleted. If you dedicate it to a lesser purpose, it will become depleted. If you publicize it, it will become depleted. Dedication is the method to prevent virtue from being depleted and to increase and strengthen it. Regarding the recipient of the dedication, dedications are effective when made in the presence of representation of the Three Jewels. Dedications are effective when made in the presence of someone with bodhichitta. Dedications are effective when made in the presence of your lama. What you dedicate is all virtue of the three times. This includes all the virtue of the past, present, and future. All the roots of goodness can be summarized as three types: the virtue born of generosity, born of discipline, and born of meditation. “Until that is attained, in every life, may I acquire a human body with excellent leisure and resources. Having acquired a human body, may I encounter a spiritual friend of the mahayana. After I have received both teaching and instruction from the spiritual friend, may no outer or inner obstacles to their practise arise. May I achieve the supreme siddhi of mahamudra. May it be just so.” Recite that three times. Thus dedicating to their benefit those virtues done on their behalf become a great virtue for oneself. Therefore, it is said that you should also dedicate the virtue of the living. The completes the ritual for dedications for the living and deceased, which was recorded from Rinpoche’s speech. How should we do dedication? We should dedicate all the past, present and future merits of ourselves, all sentient beings, all the Buddhas and Bodhisattvas as well as the source of all good deeds, our Buddha nature. This is the special method of Kyobpa Jigten Sumgon, the founder of the Drikung Kagyud lineage. Why should we dedicate future merit? We may forget to dedicate merits in future when we have done good deeds, so we dedicate merit now for those circumstances. Dedicating future merits will also make it easier for us to accumulate merit in the future. “Recalling the Guru is the most auspicious, recalling the Guru is greatest joy.” The Guru is the embodiment of the Triple Gems. Recalling the Guru brings blessings, recalling the Guru brings siddhis, recalling the Guru obliterates obstacles, Guru is the most true refuge. Ah Song Tulku Rinpoche told the Chinese students a story: during the recent Yushu earthquake, frequently many hundreds of corpses from the earthquake are transported to the sky-burial site at Yachen for sky-burial. One day, when Rinpoche was driving along the road beside the sky-burial site, he observed with his clairvoyance that halfway up the mountain, amongst the tens of corpses in the sky-burial site was the consciousness of a nun, she was still in meditative composure. Rinpoche immediately stopped the car and blessed that nun, leading her to be reborn in Amitabha’s pureland. Rinpoche said she had died in the earthquake, but when she was dying, she was thinking of her Guru and entered into a samadhi, and was waiting for her Guru to guide her. 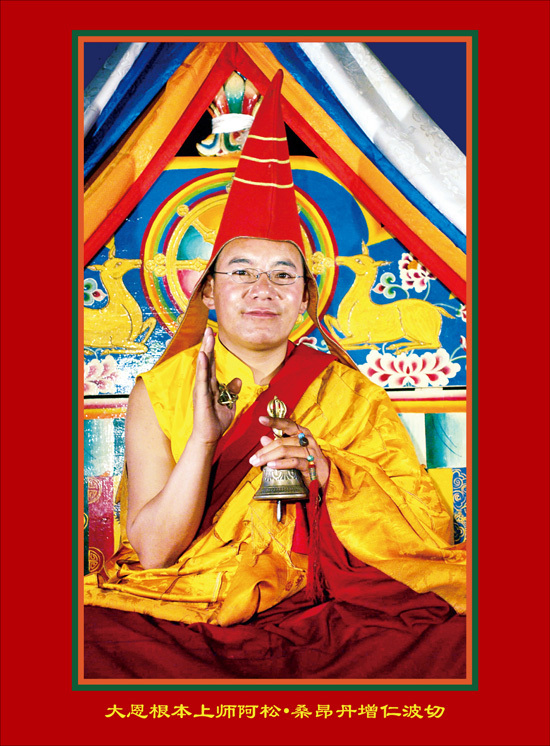 One day, a Tibetan nun came to Ah Song Tulku Rinpoche to report her meditative progress. She did not speak but instead used her hand to signal, sometimes pointing to her heart, sometimes pointing to the sky, sometimes pointing to her teeth. Rinpoche imitated her in not speaking, but instead gestured in an interested manner, giving her the answer to her questions. Seeing that the nun was satisfied and kept nodding her head, it seemed that she understood Rinpoche’s answer. Rinpoche also gave her a thumbs-up praising her. Rinpoche further said, “For those who have faith, there is no such thing as lacking the 8 freedoms. Look at her, she was born deaf and mute, but due to her faith in the Guru Triple Gems, the manifestations of Togal still appeared. Those people who are without faith are the real ones without the 8 freedoms. Only with faith, can we practise Togal with accomplishment. Without it, there can be no accomplishment. With faith, one can receive the Guru’s blessings. Faith is the most important!! The View of Dzogchen can only be bestowed by the Guru. Without the Guru’s blessings, there is no way to truly realise the view. Even if you practice diligently your whole life, you can only understand the view intellectually, but that is not the true view. Praying to the Guru is VERY VERY important! Receiving the Guru’s blessings, one can then truly realise the view. Without the Guru’s blessings, it is forever impossible to have the view. Everything in Dzogchen has no other source other than the Guru’s blessings. During practice, apart from using observing and resting meditation, one must always supplicate the Guru. There are some people who do not wish to rely on the Guru, they hope to rely on themselves to realise the Dzogchen, that is impossible. The Guru is the source of all siddhis, the source of all benefits. (Phurpa Tashi Rinpoche is also a heart-son of Achuk Lama Rinpoche, he is considered widely to be the mind-emanation of Guru Padmasambhava himself and at a young age, he has also completely realised Dzogchen and has evidenced a light body in photos on certain occasions) Phurpa Tashi Rinpoche When we visualise Buddha Amitabha, Avalokiteshvara or the very kind root Guru above our crown, we should recall that this figure is the embodiment of all the Buddhas and Bodhisattvas in the past, present and future. We should have this kind of all-inclusive pervasive faith. If one does not have this kind of pervasive faith, then the blessings received is not complete/perfect, instead we only receive limited blessings. For instance, when two people pray to Buddha Amitabha, one person understands this and knows that Buddha Amitabha is the embodiment of all the Buddhas and Bodhisattvas in the past, present and future, therefore praying to Amitabha is equal to praying to all the Buddhas and Bodhisattvas in the three times. But for the other person who has heavy discriminating thoughts, Amitabha is just Amitabha, completely unrelated to other Buddhas, he will pray to Amitabha with such a mindset. These blessings received in these two cases are completely different. The first person who regards Amitabha as the embodiment of all the Buddhas and Bodhisattvas in the past, present and future would receive a total and perfect blessing, whereas the second person, although he has faith in Buddha Amitabha, receives an incomplete blessing. This pervasive faith is extremely important. Whether one can receive the blessings of all Buddhas and Bodhisattvas of the three times and ten directions completely depends on whether your understanding of dharma and the faith during your supplication is pervasive and complete. This point is extremely extremely important. There are especially some laypeople who have many loopholes in their practice, always using a biased or one-sided way to pray. This will not allow them to receive the full blessings of all the Buddhas and Bodhisattvas of the three times and ten directions. This entry was posted on 12121212, in Practices. I pray from the depths of my heart not to be separated from your three doors. By this roots of merit, may it be swiftly accomplished! This supplication prayer to Ah Song Tulku was self-arisen and written down on the 15th day of the Miracles Month by the one with the title of Khenpo (His Holiness Ah Chuk Rinpoche) at the request of Lodro Thaye. Virtue! obstacles all dispelled! May Dharma increase and flourish!!! (post – note , as an auspicious arising today, i post this prayer of this excellent master online, for those of you who do not have any Gurus, you can recite his prayer and pray to him thinking that he is inseparable from all the authentic and realised masters. Praying to the Guru is the essence of all practices and brings the swiftest accomplishments. This entry was posted on 12121212, in Practices and tagged Achuk Lama Rinpoche, Ah Song Tulku, Guru, namkhai nyingpo, padmasambhava, rainbow body, realised. At the feet of the sacred master, respectfully I pay homage! So keep in mind these instructions for the moment of death. Everything will only enhance naturally arising wisdom! There will be the illusory experiences of rising and falling, shaking, and haziness. And the dissolution of earth, water, fire, wind and space. Death is merely the return of borrowed elements. In the face of rigpa itself, there is no birth or death. As dying exists nowhere, it is absolutely unreal. In the experience of this, generate courage and confidence. The arising of rigpa is not obstructed in any way. Earth, water, fire, wind and consciousness dissolve into space. As awareness parts from the inanimate, there is an experience of pure awareness, devoid of phenomena. Separated from the ordinary mind, the great primordial purity of dharmakaya dawns. You will be freed directly, in a single instant. And gain the dharmakaya of twofold purity. Thereafter, clear light appearances—manifestations of the ground—will arise. You will be freed in the original state, and attain awakening. It is crucial, therefore, to recognize everything as intrinsic radiance. Through recognizing the essence, you will gain enlightenment. The dream-like bardo of becoming will dawn. And be assured of gaining liberation in the next life. Will delight the fortunate children of my heart. Longchen Rabjam Zangpo, has set down. Become fully enlightened within the primordial realm! This complete instruction for the dying, a secret, unsurpassed introduction, was composed by the heir of the victorious ones, Drime Özer, in response to the requests of devoted disciples, in the isolated hermitage of Khothang Rinchen Ling. | Translated by Adam Pearcey, Rigpa Translations, 2010. With many thanks to Alak Zenkar Rinpoche and Patrick Gaffney. Tulku Thondup Rinpoche’sPeaceful Death, Joyful Rebirth (Shambhala, 2005) contains a partial translation of this text, which in Tibetan is called bar do’i gdams pa tshangs sprugs su gdab pa gnad kyi man ngag. This entry was posted on 12121212, in Teachings and tagged bardos, longchenpa.